Asset Allocation is the center of all our decisions. We know that the key element to produce consistent returns is building a Disciplined, Global and Flexible Asset Allocation. We know Absolute Return Funds are quite popular, but we think most of them are quiet inefficient. They were created when interest rates were between 3% and 5%. At that time, offering Libor+200bp was usual and achievable if the Manager had the right skills. Now at current situation, when World Risk-Free Rates are 0% or even negative, we think that offering this type of Absolute Return Funds, trying to deliver hundred times the current Risk Free Rate is not feasible. We have created a new fund concept: a Relative Return Fund with a Minimum Sharpe Ratio Target. 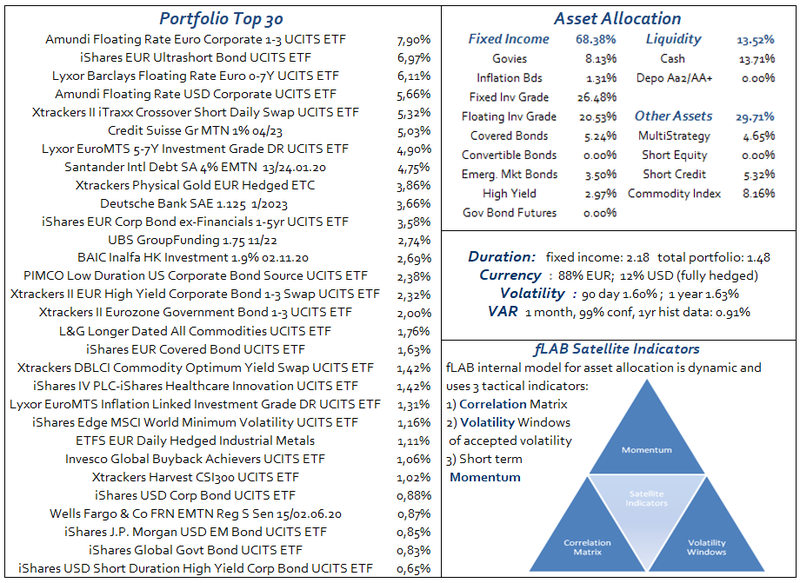 In a game of non-stable correlations, fLAB Satellite role is to try and find the best combination between assets to provide positive relative returns. 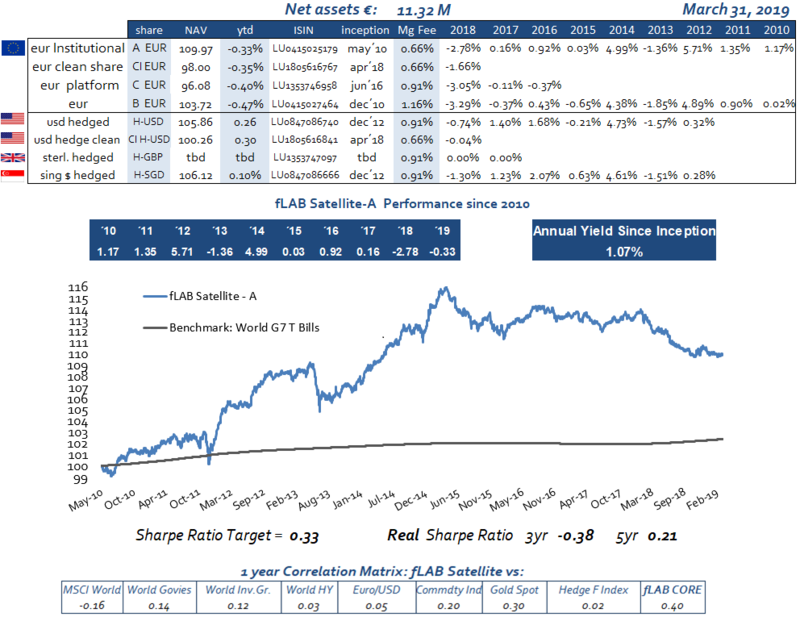 In essence, fLAB Satellite target is to maximize the Sharpe Ratio. The most important part of the Portfolio is a Fixed Income Portfolio. Then we may add an overlay of liquid assets, mainly through ETFs: Commodities (Metal, Energy, Agriculture, Precious Metals), Currency Products, Inflation Linked, High Yield, Convertible Bonds, Credit Markets, Equity Strategies, and a few more sub-assets. 1) In House Momentum Indicators of each asset class (ETFs/ETNs) to be added short-term (up to 6 months) or mid-term. 2) Correlation Matrix between the assets included in fLAB Satellite and the traditional ones, and also correlation and covariance between all assets. 3) Volatility Windows of all assets and the aggregated one. Factsheet – Satellite – USD, SGD & GBP download pdf file.